Happy 5776 A.M.! I hope your New Year is off to a good start. 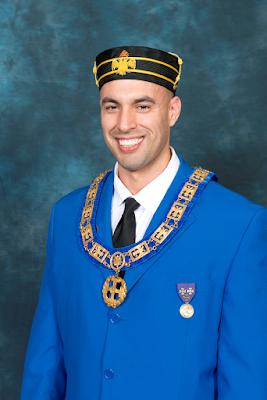 I would like to begin this column by first thanking the members of this Valley for allowing me the privilege to serve as Master of Kadosh of the San Jose Consistory. I would also like to thank our 2015 Master of Kadosh, Bro. Bud Ramsey KCCH, for all his guidance and leadership. In case you are unawares, Bro. Ramsey is not only a Past Master of Kadosh, but also a Past Venerable Master of the Lodge of Perfection, a Past Wise Master of the Chapter Rose Croix, and a Past Commander of the Council of Kadosh. He has certainly left behind some pretty big shoes to fill and a stellar example for all Scottish Rite Masons to follow. Thank you again Bro. Ramsey for your exemplary dedication and service. Now, since this submission will be printed in the February Rite Word, I thought I would share with you a brief history of one of my favorite days of the year, Valentine's Day. There's no doubt it is one of America's most popular holidays. More than 62% of Americans celebrate by sending greeting cards and flowers; giving candy or other gifts; enjoying romantic dinners; or all three. But the history behind Valentine's day turns out to be somewhat surprising. For example, the roots of Valentine's Day go all the way back to a raucous ancient Roman fertility festival held in mid February called Lupercalia. Lupercalia was conducted annually on February 15 under the superintendence of a corporation of priests called Luperci. The origins of the festival are obscure, although the likely derivation of its name from lupus (Latin: “wolf”) has variously suggested a connection with an ancient deity who protected herds from wolves and with the legendary she-wolf who nursed Romulus and Remus. As a fertility rite, the festival is also associated with the god Faunus. The festival began with the sacrifice by the Luperci of goats and a dog, after which two of the Luperci were led to the altar, their foreheads were touched with a bloody knife, and the blood was wiped off with wool dipped in milk; the ritual required that the two young men laugh. The sacrificial feast followed, after which the Luperci cut thongs from the skins of the sacrificial animals and ran in two bands around the Palatine hill, striking with the thongs at any woman who came near them. A blow from the thong was supposed to render a woman fertile. In 494 CE, the Christian church under Pope Gelasius I appropriated the form of the rite as the Feast of the Purification. But who was St. Valentine? Not much in known about the holiday's namesake. First of all, there was more than just one Christian cleric named Valentine. One of them was sentenced to death for performing marriage ceremonies in secret after Emperor Claudius II banned marriage for young Roman men. Apparently, he was of the belief that single men made better soldiers. It wasn't until the 1300's though that the holiday became definitively associated with love and romance. Back then, people believed that February 14th was also the beginning of mating season for birds. The first written Valentine greetings appeared in the 15th century. And by the 17th Century, people in Great Britain had begun a tradition of exchanging Valentine's Day cards or letters. Valentine's Day soon caught on in the U.S. as well. The first mass produced holiday cards emerged in the 1840's and Valentine's Day soon exploded into a major consumer holiday. Today, an estimated 1 billion Valentine's cards are sent each year, more than on any other holiday except for Christmas. More than 35 million heart-shaped boxes are sold and more 220 million roses are produced for the holiday in a typical year. All together, Americans spend almost 20 billion on Valentine's Day; or an average of about $130 per person, per year. While the most popular gifts were candy and flowers; nearly 20% of Americans splurge on jewelry, shelling-out as much as 4 billion dollars annually. So, if this month you find yourself fortunate enough to be one of the above statistics, I wish you a Happy Valentine's Day. Be thankful and express your love the best way you know how. And if you don't…who cares? You just saved about 130 bucks and have a whole evening to do what thou wilt. Enjoy it! See you at the next RSM. P.S. Checkout the links below next time you get a quiet moment to yourself.